When hair is virgin it has all its natural chemical composition. With the wear and tear of time and accentuated by the use of chemicals, hair loses its properties. 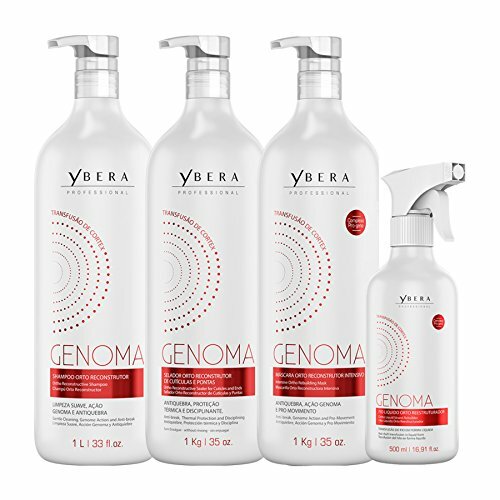 YBERA GENOMA offers a treatment that surpasses all existing in the cosmetics market and exceeds the limits of a perfect result. YBERA managed to extract from nature the same chemical characteristics that make the hair and cloned it. The hair is composed primarily of carbon, hydrogen, nitrogen, oxygen and sulfur, together form a protein called alpha-keratin, which represents 85% of the composition of hair. YBERA managed to clone the DNA composition of a healthy strand and transfer it to completely repair a damaged hair. GENOMA is compatible with all hair types, especially those who are critically abused, elastic, brittle and overly processed. GENOMA is a treatment that works without heat and its application is fast and comfortable. INSTRUCTIONS: 1. Wash the hair 3 times with Genoma Shampoo Rebuilder. Let it stand 5 minutes and rinse.2. Remove 50% of humidity and divide the hair into sections. Proceed to apply the Genoma Liquid Hair Ortho Rebuilder. Align the thread with a fine comb. Let it stand 20 min.3. Rinse with water. Remove excess moisture with a towel.4. Apply the Genoma Mask Ortho Rebuilder. Comb the mask and let it sit 25 minutes.5. Rinse and apply a small amount of sealant Genoma Sealer Ortho Rebuilder Cuticles and Tips.6. Finish as desired. If you have any questions about this product by Ybera Professional, contact us by completing and submitting the form below. If you are looking for a specif part number, please include it with your message.